Is there a way to get your toddlers to STOP EATING CRAYONS?? Or putting anything in their ears? How about stop sticking their fingers in your nose? Or their forks – WITH FOOD – in their nice clean freshly washed hair?? My last minute-throw-together dinner tonight was a whole mess of leftovers all mashed together in a bowl with some random additions. To the leftover stuffing and roasted cauliflower I had on hand, I added in some mayo, some oil & vinegar, the remains of one jar of Garlic Confit and then some leftover Leek Confit too, you know, for good measure. 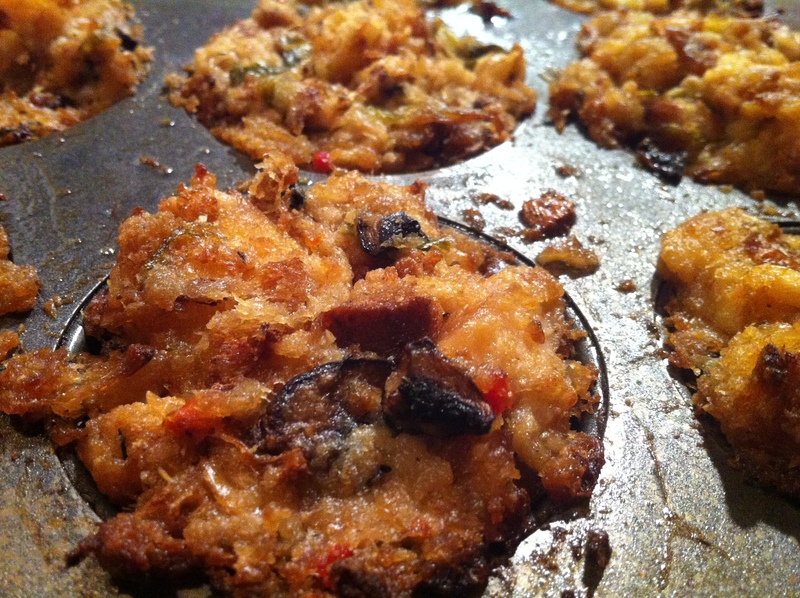 Then I mushed it together with my fingers, scooped mounds into a buttered muffin tin, shpritzed the top with a little pam to get them crispy, and whacked the pan into a 350º oven for about 40 minutes. More or less. Because screaming toddlers make you kinda lose track of time. Thank goodness they’re adorable. I just about melt EVERY SINGLE TIME they start giving each other hugs or doing Ring Around The Rosie together. Mind you, this recipe is sorta Ongepotchket (Yiddish for ‘thrown together without planning’). Tomorrow I definitely have to start getting back on track with Weight Watchers again. Tomorrow. Definitely tomorrow. Random condiments you have laying around and want to use up. 1- Oven at 350º. Grease a muffin tin (I used one with 12 wells). 2- Dump everything into a large mixing bowl and mash. 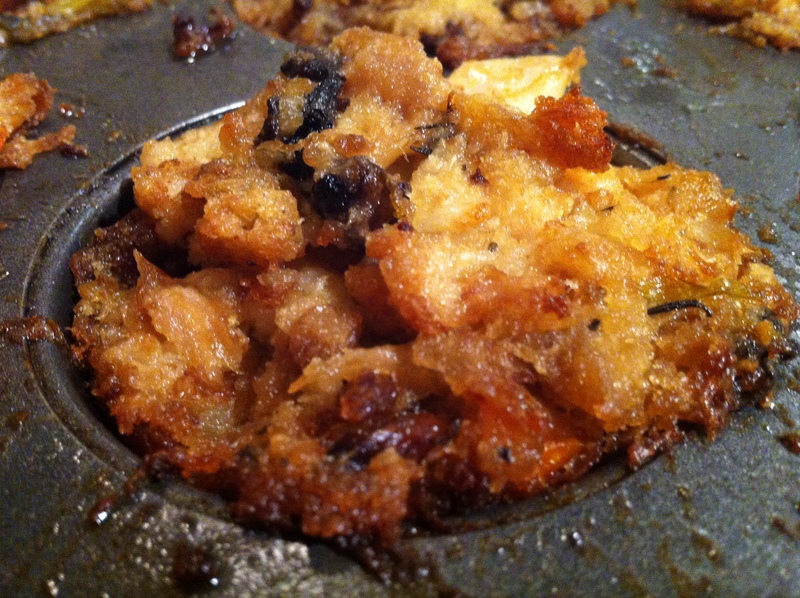 You want the stuffing mix to be wet enough to hold together, but not so wet it won’t scoop up with your hand. Keep adding stuff until it feels wet but not soggy. Feel free to taste too. Adjust seasonings as you see fit. 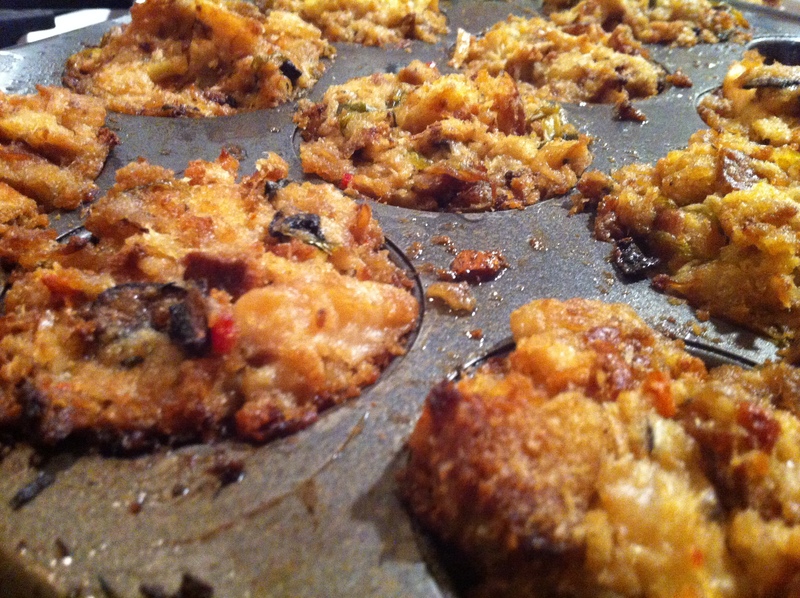 3- Scoop a mound of wet mess into each muffin well and shpritz the tops with a touch of Pam so it crisps in the oven. 4- Whack the whole shebang into the oven for 30-40 minutes. If it starts smelling good – check it. It might be done. We ate this tonight with the remnants of the turkey (heated up) and some homemade pickles (recipe another day). Oh, and the babies devoured 2 bowls of Grandma’s Applesauce too. While cleaning them up, C had to remove a piece of turkey from J’s ear.